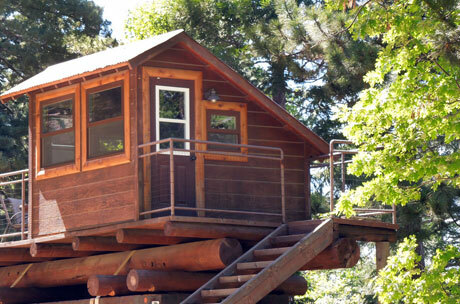 Experience sleeping in an enchanting small outdoor cabin…yes, we have two on the property, each with its own deck. Restroom facilities are immediately adjacent. Bring your sleeping bags for this experience. Pine Mountain Camp is truly a unique wonderful experience. A beautiful private setting amongst the pines, cedars and oaks with views to die for of beautiful Lake Arrowhead! So private yet minutes from shopping, restaurants and use of the day beach at Lake Arrowhead. The accomodations are picture perfect in everyway, plus the outdoor living spaces can't be beat anywhere! Absolutely love Pine Mountain Camp!!! Hope to spend lots of time there!